Father’s Day was extra special for me. I was born on my dad’s birthday, and as I grew older, he became my best friend. He was a butcher all of his life, and there was no meal more special to him than a thick New York, T-Bone, Porterhouse or Rib Eye cooked, not on a grill, l but in a skillet with a little garlic, olive oil and butter. In talking with many chefs in our Valley, that’s just the way they love their steak, too! 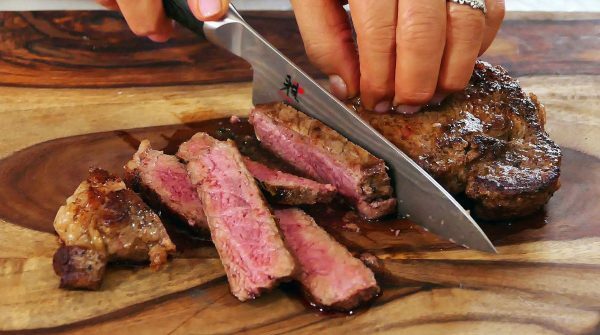 So just in time for Father’s Day, I’m giving you a simple but great recipe and some important tips for cooking the perfect steak in a skillet. This Sunday, let dad kick his shoes off, maybe grab a cold one or a nice glass of red wine and you go ahead and steak your claim on the kitchen! You won’t need a lot of ingredients. Look for his favorite cut of meat. Make sure it’s top quality and nice and thick. That’s where it all starts. Fresh garlic, good olive oil, unsalted butter and maybe a fresh herb or two is all you need. If you have a cast iron or heavy skillet, that will be preferable to a non-stick pan. The cast iron will give your steak a perfect sear—and that equals flavor. Also, if you don’t have one, this would be the time to invest in meat thermometer. (At about $3.00, it’s one of the best kitchen investments you can make.) Make the steak the star of the plate; add a piping hot baked potato and a blue cheese wedge salad, and you’ve got the perfect and memorable meal for this special occasion. Happy Father’s Day to all of our Arizona dads! Check out my How To Video Here!